I’ve been making a version of this pasta sauce for close to a decade, and in that time I’ve tinkered and refined, simplified and streamlined it to were I finally think I have it where I want it. 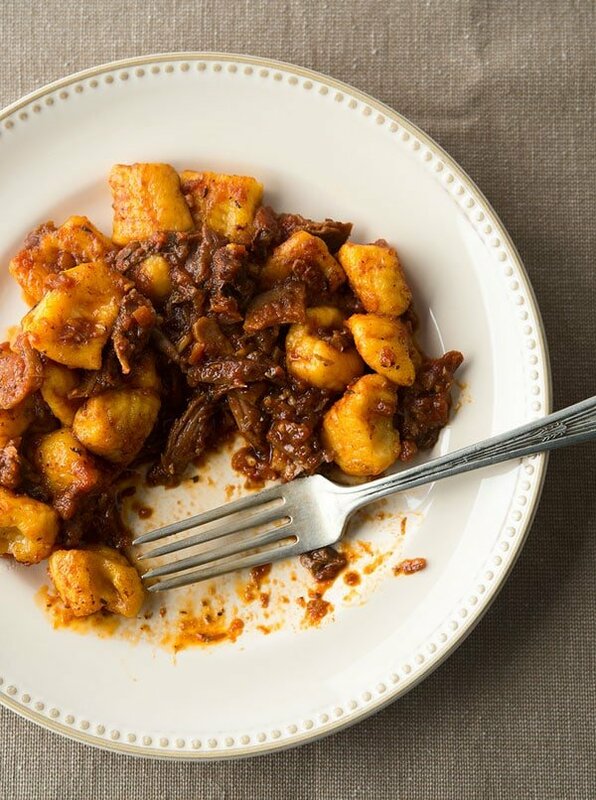 Sugo d’anatra, or duck ragu, is a classic dish in Italy. Basically it is a long-simmered pasta sauce that is intensely flavorful, so you don’t need a ton to get the flavor punch going on. There are several important keys to the success of this recipe. First, you need a good sear on the meat. Take your time and get your duck or goose bits good and browned — if you have a thick layer of crusty stuff built up on the bottom of the pan, even better. I used to do this in the pot I cooked the sauce in, but I find I can do it about as fast and a lot cleaner by roasting all the meat in the oven. This is a must if you are making a big batch, or you will be browning duck legs in a pot for almost two hours. Second, you want as many ducky elements as you can muster: I use home-rendered duck fat and homemade duck broth to go with the duck meat. Of course if you don’t have these, use olive oil or butter, and chicken broth. Finally, you need time. You can’t do this sauce in less than 3 hours, and it’s better if it gets a chance to cook lazily all day. Duck legs, especially wild duck legs (and even moreso wild duck wings!) require time to tenderize. Domesticated birds will need only about 90 minutes to 2 hours. 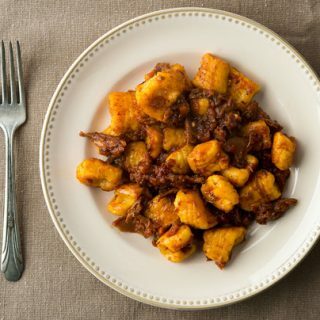 And, like all stews and long-simmered sauces, this sugo is best the day after it’s made. This is a Sunday supper sort of sauce, something you make when you have time to hang around the house. This makes a decent amount already, but you can double the recipe for either big groups or to eat all week. As for a pasta choice, really anything goes. Wide, flat pappardelle or the slightly narrower tagliatelle are traditional, but I really like this ragu with short shapes like gemelli or cavatelli. Or you could go the gnocchi route, which is what I did here. 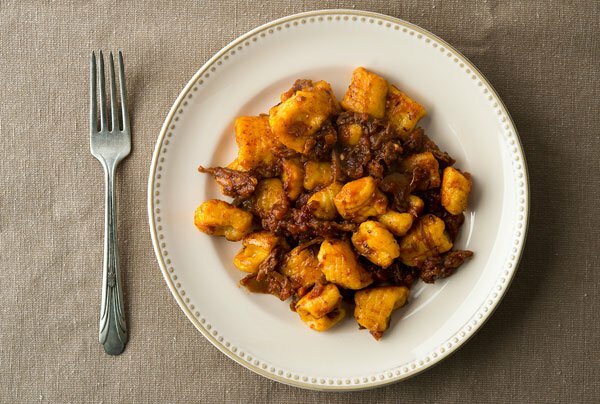 If you want to make these awesome pumpkin-ricotta gnocchi, my recipe is over at Simply Recipes. Lay out all the duck legs and wings skin side up on a roasting pan. Sprinkle some salt over them and pop them in the oven. Turn the heat to 400°F. Don't preheat the oven, because you want the fat in the duck to slowly render out. If you happen to be using skinless legs and wings, you will need to coat them all in olive oil before you salt them. Regardless, roast until they are nicely browned, about 45 minutes to 1 hour. Meanwhile, soak the dried mushrooms in hot water for 30 minutes, then remove and chop. Strain the mushroom water through a paper towel to remove debris and reserve. When the duck legs have about 15 minutes to go, heat a large Dutch oven over medium-high heat and add the duck fat. When it melts, add the minced onion, celery and carrot and brown them well. Salt the veggies lightly as they cook. When the vegetables are getting brown, add the tomato paste and mix it in well. Cook the mixture until the tomato paste begins to turn brick red, about 5 minutes. If the duck legs aren't ready, turn the heat off on the Dutch oven. If they are, remove the legs and put them in a bowl or something. If there is a lot of fat in the pan, drain it off. Pour the mushroom water and the white wine into the roasting pan and use a wooden spoon to scrape up the browned bits. Pour this into the pan with the Dutch oven. If the legs aren't ready, hang tight until they are and then do this. Mix the liquid from the roasting pan into the tomato paste-vegetable mixture and bring to a boil. Cook it down by half. Add the duck legs and any juices that have collected in the bowl to the Dutch oven. Cover with the duck broth and the tomato puree, add the bay leaves and oregano and mix well. Bring to a gentle simmer and let this cook for at least 90 minutes. It will look like duck stew at this point, which is good. You want everything to cook down slowly. You're ready when the meat wants to fall off the bones. Fish out all the legs and shred the meat off, then return it to the pot. If the "stew" has cooked down into a nice pasta sauce, you're good to go. If it hasn't, turn the heat up and boil it down until it's as thick as you like. Add salt and black pepper to taste when you are ready to serve. At the last minute, stir in the parsley and you're ready to rock. Grate some cheese over everything at the table. This sauce will keep a week to 10 days in the fridge and will freeze for a year. Ward: Yep. We’re neither French nor Spanish. And besides, mirepoix can be different depending on what recipe it is. Sometimes there are no carrots, sometimes there is extra celery, etc. Only professional cooks here use the term mirepoix, and only Spanish speakers use sofrito. im really enjoying your leg recipes, but starting to end up with ducks with questionable fat. question – how do duck legs taste if i thoroughly skin and de-fat?? Darren: Still good. When deciding whether to skin or not, generally speaking, pintail, green teal, specklebelly geese and wood ducks will almost always have nice fat. Mallards typically do, too. As will any duck eating rice or corn or barley. We’re looking at raising our own ducks (and geese). 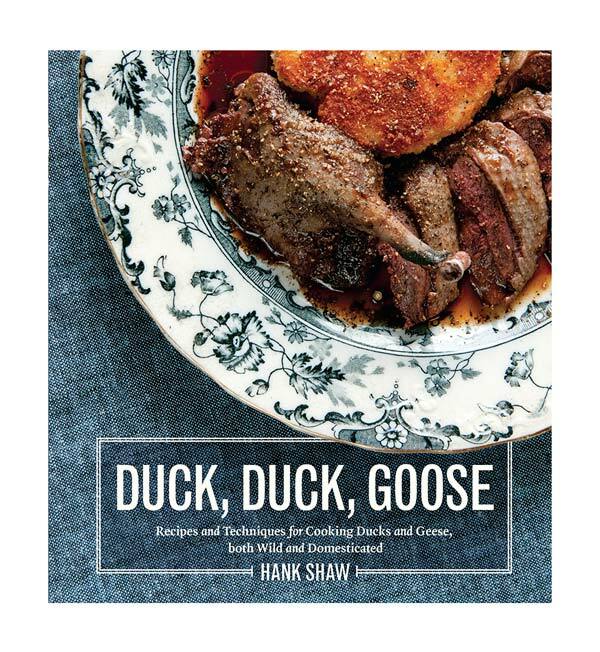 I think we’ll be using this recipe as one of our go to’s for the duck. And for those spare shoulders of lamb and pork we’ll have from that stock. Thanks a lot. The level of detail is really appreciated, and the extra insights and the in recipe tips and pitfalls are a big help. Thanks, and really looking forward to some of this with some fat pappardelle. We often add in some worcestershire sauce, or mushroom ketchup (with barley) to stews and ragu’s for that big-hug base note of umami. That could be a really good addition here maybe. And I’m tempted to try it with some balsamic too – a little additional acidity can really help highlight tomatoes sweetness.